I love fishing. I hate fishing. From the first time I held a rod in my hand I’ve wanted to catch the huge one. I’ve wanted to tell stories of the Lunker that took my line, the mammoth beast from below that I fought into the boat and the epoch struggle between man and fish. I’ve dreamed restlessly of battles between the bass of legend and my own fishing skill. The Old Man and the Sea? He’s got nothing on me compared to the fish of my dreams. But daytime reality is cruel to most fishermen. In reality, I spend more time untangling the bird’s nest that was once my line. In truth, I lose more hooks in low hanging tree limbs than down the throats of fish. When I was a boy, my brother and I spent countless hours along the banks of the Mississinewa River, casting our lines into the muddy waters and waiting for the big one to come along. Looking back, it is fair to say that we spent more time throwing in rocks and bottles than hauling out any fish. But the joy of those days always brings me back to the water’s edge. In analyzing my life-long angling failure, I quickly realized that my problem is not a lack of gear…although, I believe that more is always better. I have 17 sizes of hooks. I have 42# of sinkers and weights. I have enough bobbers to raise the Titanic. Lures? You bet! Jigs, Poppers, Propellers, Buzzers, Scoops, Spoons, Plugs, Flies, Larva, Spinners, and Worms. I’ve reviewed my technique and based on all the Saturday morning Bill Dance episodes, I’m doing fine. Boat? Fishing boats, row boats, canoes, and paddle boats. Material? Wood, metal, and fiberglass. I’ve tried them all. Water? Stream, creek, crick and trickle. Pond, puddle, pool and piddle. River, lake, reservoir, and faucet. But this week, for the first time in more than 40 years, I experienced the sweet success of fishing. 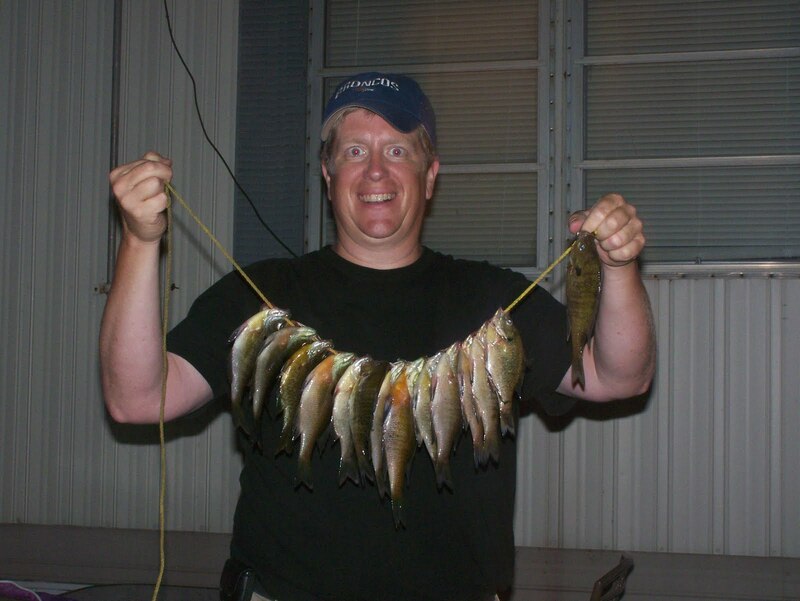 The bluegill and sunfish weren’t huge and then didn’t put up any line-breaking fight, but they filled my stringer, the frying pan, and my family’s stomachs. For the first time in a very long time, I enjoyed fishing. A rod, a hook, and several B-moths were enough to restore my dream. Now if you will excuse me, I need to visit Gander Mountain. They have a huge sale on bobbers.